International Women’s Day, 8 March 2018, coincides with a rising determination towards respect for women’s rights, equality and justice and a global movement for change that enables women everywhere to reach their full potential. This year’s theme is: ‘Time is Now: Rural and urban activists transforming women’s lives’. 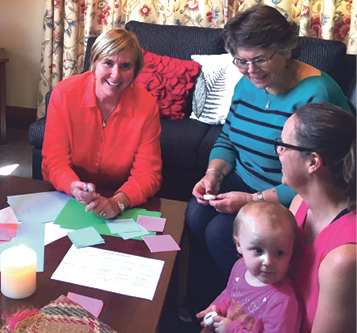 Women from some of the many ministries in Wellington and Palmerston North dioceses comment about being Catholic women today. As a young social worker I sat with Christina, a 19-year-old Catholic in her cell at Arohata prison. She was a gifted artist and had made a poster. It read, ‘when I die I will go to heaven because I have lived all my life in hell’. Her ‘hell’ was her life of powerlessness, poverty, racism, abuse, silence, trauma and violence. ‘Hell’ is the reality of many women in our country today. Women are victims of situations that deny their rights, destroy their dignity and extinguish hope and life. Kitty McKinley (l) planning for a Challenge 2000 women’s spirituality programme. Christina’s life was very different to mine. Yet we were and are intimately connected as women and as citizens of Aotearoa-New Zealand. International Women’s Day challenges us to reflect and act on the hell lived by women in our country and world and to commit ourselves to transforming women’s lives. This is what our Baptism demands. We are commissioned to be world changers carrying justice, hope, liberation for all – particularly the most marginalised. Wherever there is injustice and hell it is our duty to change it – woman by woman, man by man, child by child, human by human – wherever we know it is happening. This includes working for structural change that recognises and promotes the rights of women at every level and in every sector of human activity. Our Catholic community included. Women are guaranteed rights under Canon Law. We are over represented in roles in parishes caring for others and in the pews. We are under represented in decision-making bodies in our church and of course excluded by gender, from the highest level of decision making and pastoral responsibility. In parishes the women can be legitimately silenced in a system that supports ordained male authority. When all baptised women and men can say a resounding yes to live the gospel together, as equals, then the Kingdom of God is truly here. Kitty McKinley is Founder and Project Manager for Challenge 2000. 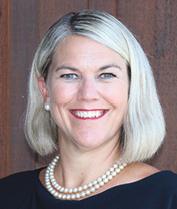 Paula Wells, Principal Sacred Heart Girls’ College, New Plymouth. Leading with authenticity is something that has begun to settle with a higher degree of comfort now that I have completed my first three years of Principalship at Sacred Heart Girls’ College New Plymouth. This is in no part due to my unwillingness to exhibit authentic leadership in the first instance, but more to do with a growing understanding of who I am in leadership, both my greatest strengths and my deepest vulnerabilities. The degree of self-knowledge that comes from better understanding myself in leadership has enabled me to leverage off these strengths, and to be comfortable with my vulnerabilities to an extent where they can be embraced; the gift of acknowledging one’s shortcomings allows for honesty, integrity and an opportunity to leverage off the gifts and talents of those I work with. The privilege of leading in this Catholic college is enhanced due to the example lived by our forebears. The Sisters of Our Lady of the Missions, whose pillars are Mission, Service and Contemplation, brought education to the tangata whenua and young women of Aotearoa New Zealand more than 150 years ago. Their example of gritty toil and tenacity in active support of the vulnerable and marginalised is an exceptional example to young women of today, as is the sisters’ gift to us of connecting with our spirituality through prayerful contemplation. Their example has helped us formulate our own Manawa Mission, living their example through Ako, Manaakitanga and Wāhine Toa. We Live the Mission through Ako when we take every opportunity to learn; we Live the Mission through Manaakitanga when we respect and love one another; and we Live the Mission through Wāhine Toa when we respect and love ourselves and grow into strong, independent, resilient women of integrity. I am blessed to be leading Sacred Heart/Manawa Tapu and to have exceptional leadership example in Euphrasie Barbier and the Mission Sisters in being authentic, hopeful and hardworking in pursuit of the shared vision of our community. 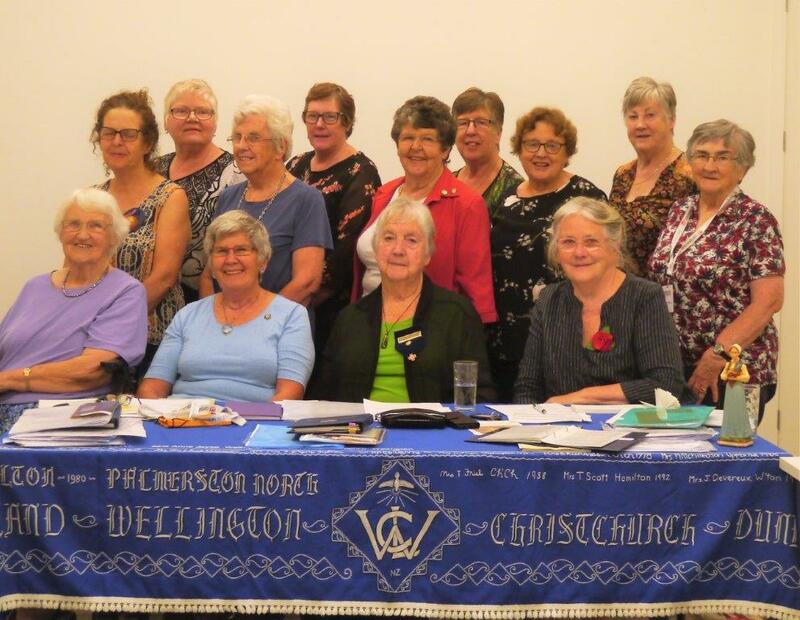 Ngā Whaea Atawhai o Aotearoa Sisters of Mercy New Zealand came to Aotearoa at the request of wāhine who asked Bishop Pompallier for Sisters who would be alongside Māori women and children. Since we arrived in 1850 a primary mission thrust for us has been working to empower women. It is significant then that the theme of 2018 International Women’s Day taps so well into what we know as our call. Last year we called on people from all over our country to join us on the forecourt of parliament where we made a plea for Housing for All. Hundreds responded in person and many, many more responded by contacting us. It is known that homelessness affects many women and children who do not have the finances to enhance their lives. Our Mercy Sisters in Tonga and Samoa use their energies to seek justice and to educate children so they as adults will be able to change the world in which they live and move. Surely this is what all we women of Aotearoa must do in confronting today’s faces of slavery – oppression, inequality and homelessness – which affect our sisters in Christ. Long held narratives are being disrupted by newer narratives and we women must be at the forefront of understanding and implementing these emerging calls for justice and equality. God is with us in this endeavour. Pope Francis urges us to: ‘Offer our thoughts honestly and without fear in the matters that concern us’. 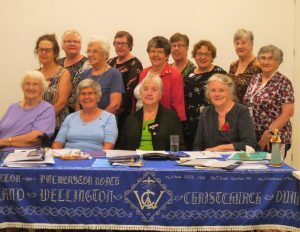 As part of its thrust towards renewing and reinvigorating the Catholic Women’s League of Aotearoa New Zealand, our National Board has been focusing on the vision that led Margaret Fletcher to found the League in 1906. Her concern for the ‘Dignity, Equality and Freedom of Women’ seems no less relevant or important at this time in the history of Church and society. CWL – National Board 2018. Among our recent actions to offer our voice to the Church, we have shared insights on the 2014 Synod on the Family, the Safe Church programme, Evangelii Gaudium, Misericordiae Vultus, Laudato Si’, Mercy in Creation, Leadership, Change and more. We encourage our members to ask and answer the hard questions about poverty, euthanasia and assisted suicide, the trafficking of humans, abortion law reform, youth suicide, children of prisoners, drug abuse and social issues, both national and international, around the welfare of women and children. We are challenged to be a group of women willing to answer and respond to the hard questions and be witnesses to our motto of ‘Faith and Service’. A motto bringing life, energy and informed voices into our communities. We continue on the journey begun in 1906 by Margaret Fletcher and carried on into 2018. We acknowledge the Charism that compelled Margaret to advocate for Catholic women and we claim her ideals as our own. To be prepared for change. To be part of that change. To be familiar with the teachings of the Church. To live the Joy of the Gospel. To listen with the Heart. Let’s keep opening those doors! 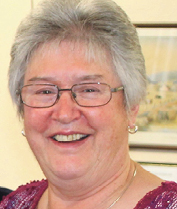 Kathleen Blackburn is National President, Catholic Women’s League Aotearoa New Zealand.